sketch of Hanging Garden spring type. 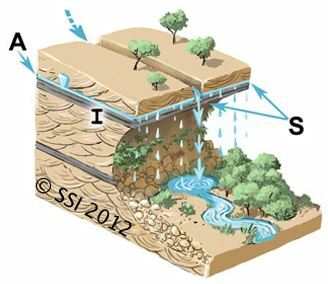 A=aquifer; I=impermeable stratum; S=spring source. The inverted triangle represents the water table or piezometric surface. Fault lines are shown where appropriate. Emerges from low gradient wetlands; often indistinct or multiple sources seeping from shallow, unconfined aquifers. Hanging gardens emerge along geologic contacts and seep, drip, or pour onto underlying walls. In the southwestern U.S., these complex springs usually emerge from perched, unconfined aquifers in aeolian sandstone formations. The hydrogeologic processes that form hanging gardens also influence the geomorphologic processes that shape the rock walls or canyons from which they emerge. There are three primary types of hanging gardens: alcoves, window-blinds, and terraces (Welsh and Toft 1981). In the US, hanging gardens support unique ecosystems with wetland, riparian and desert plants, including some species (e.g., Primula spp.) that occur in indirect light on wet backwalls (Welsh and Toft 1981; Wong 1999; Spence 2008).